STARRING ANDY SMYTH DAN HARE IAN PAXTON & JENNY MOASE is THE ULTIMATE CORPORATE, SPECIAL EVENT BAND!!! YOU NAME IT! THEY DO IT! NUMEROUS TV AND RADIO APPEARANCES, A STRING OF UPCOMING SPECIAL EVENTS, A VAST AND EVER EXPANDING LIST OF CORPORATE CLIENTS, AND NUMEROUS FESTIVAL AND CASINO APPEARANCES. Mach Hare has an uncanny knack of sounding just like your favorite artists. Close your eyes and listen. Is it THE CARS, NO DOUBT, PAUL McCARTNEY, MADONNA, JOHN MELLENCAMP, The B52s, GARTH BROOKS, CCR, MEATLOAF? You be the judge! 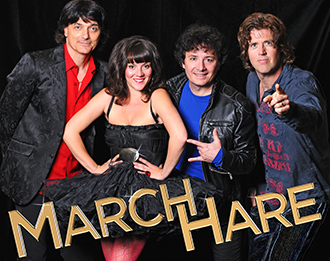 MARCH HARE takes great pride in their exceptional stage appearance and great sound. This combined with a professional attitude that is unequaled in the entertainment industry guarantees a successful event! Noteable Entertainment & Events is a Vancouver based booking agency, party rental, entertainment services and event production company. If you are interested in booking March Hare please contact us.